Somerville’s Aeronaut brewery launched its “pindrop” sessions last Sunday night, overseen by their Arts & Culture Liaison Jason McCool. 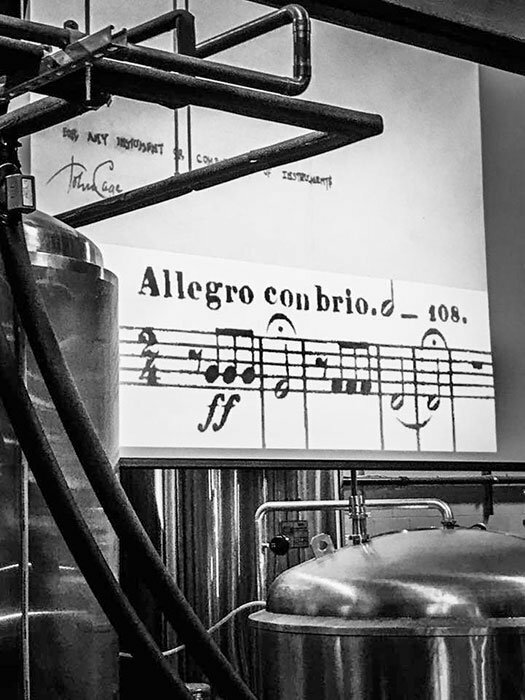 The brewery became the backstage, and a Quonset hut became the concert hall, as the Boston Chamber Symphony conducted by Avlana Eisenberg presented John Cage’s 4’33” and Beethoven’s Symphony No. 5. McCool and Aeronaut build on previous ventures in other places. A cursory compilation from memory includes Matt Haimovitz’s series of concerts presenting Bach in bars and rock clubs since at least 2000, Pincombe’s own “Music in Familiar Spaces,” and the rise of atypical venues such as Brooklyn’s Bargemusic and now National Sawdust. Here (except for turning off ventilation fans some of the time) the space is not modified from its ongoing work function. This MIT-born building is a metal-framed warehouse, square rather than Quonset-rounded, but the acoustics presents similar challenges. 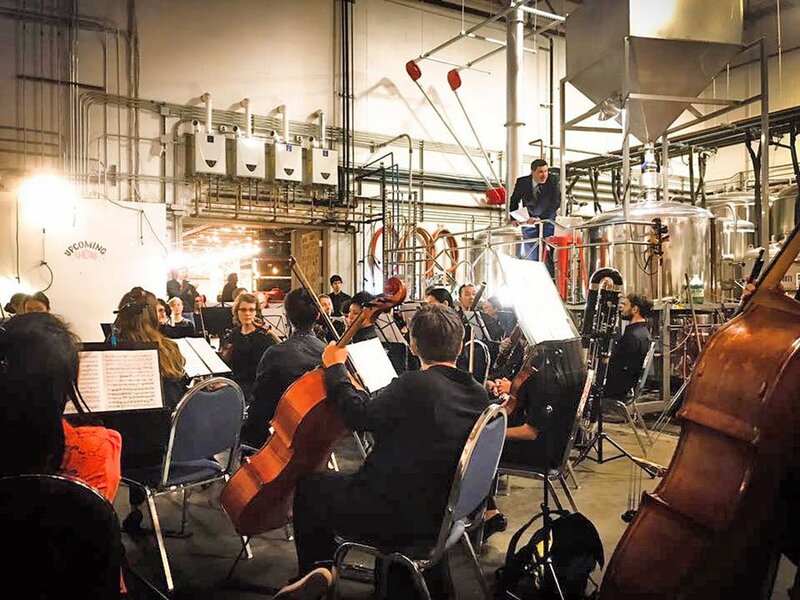 An orchestra walked into a brewery…. I voiced my concerns about music in this space previously. I have sat through enough concerts, in the house and behind a cello, and heard the litany about turning off noisemakers out of respect for those around you, and I have given my own share of such speeches too. More than convention, it reflects a reality of classical music (really all unamplified music, and even some electrically enhanced): a musical form built on a range of pitches and dynamics cannot be appreciated fully when it cannot be heard. In Aeronaut, careful curation is required to make the most of the fledgling opportunity. Steel tanks, corrugated metal construction, benches, chairs, and a bar: all hard surfaces. Would health codes ever allow banners, a start to softening the space? Brave new world this, chockablock with challenges. How will Emmanuel Music’s November late-night appearance fare? Tune in next month to find out. This month’s launch paired some of the canon’s more commented compositions, under the title “Chaos and Control.” As McCool styled it in his introductory remarks, the combination is of two of classical music’s most infamous works, their joining a “work of revolutionary deliberation”. An orchestra tunes … and silence erupts, noisily, in the interstices. With a genesis down the road at Harvard’s now demolished anechoic chamber, where Cage once went to hear the sound of silence and instead heard the sounds of his own body (recounted in Indeterminacy, reproduced and commented upon here), 4’33” attempts to be a sonic embodiment of Zen. (That is from McCool’s opening remarks, again; the curious can explore further in this BrainPickings review.) The tacet triptych hardly needs elaboration. Conducting from the catwalk, McCool led us into the downbeat, and concluded the composition after the requisite time. The performance, along with many others, is preserved on the 4’33” app, to relive again and again, sonic time sliced out of the continuum and compiled for the curious to compare and contrast. From finish to start: then Eisenberg took the baton and Beethoven’s Fifth began. Matthew Guerrieri plumbed the depths of those first four notes. We all already know this opening; its infamy lives in its fame. From symphonies to synthesizers, we have heard it. Here in a chamber orchestra performance, the sound is remarkably sparse (no more than four strings to a part; one double-bass), bereft of portent. I heard an echo of earlier iterations. The opening was tightly cohesive; as the music moved away from a unison theme, its complexity vied with the constraints of Aeronaut’s acoustic. In the second movement I found myself contemplating Handel’s Music for the Royal Fireworks, masterful use of another atypical concert space. In the Beethoven I did not hear forward momentum and seeming inevitability from introductory pronouncement to final dénouement. Musical balance hung, well, in the balance: staid tempi suited the space, but fugal passages became blurs of lines and parts. The Fifth will ride again. And so pindrop splashes onto the local scene. While low ticket prices do not include a first beer at the bar (maybe next time? ), a concert with a glass in hand is an enticement for many. Just look at the crowds for the Pops. Here’s what Emmanuel Music will bring. Watch this space as well as your social media channel of choice for details on successive sessions.